The Green Bus was our mode of transportation from the similarly named Chiang Rai to Chiang Mai and it was the certainly the most comfortable bus we'd seen since Europe. Its easy to see why the company is popular with travellers due to the facilities they provide on board. Extra leg room, wifi, tv, bathroom a free bottle of water and complimentary snacks, luxury. Even in high season seats are readily available. No need to pre book, role up at least two hours before and find the company counter and "jobs a guddun". Don't under any circumstances book through your hostel/guesthouse as you'll get slightly ripped of due to the inherent commission fee. It's not being a tight arse just travel savvy. We stayed at Diva Guesthouse 2. One of a chain of three different hostels all in great locations throughout the historic walled interior of Chiang Mai. All the typical services are provided and the staff were really cool and helpful. There are more than 300 temples within the boundaries of Chiang Mai with a dozen stand-outs of historical or architectural significance within walking distance of each other. So you can safely say that we were once again "WAT'ed" out within a day. We decided to take a Tuk Tuk and visit the very popular temple referred to as "Doi Suthep" although this is actually the name of the mountain it is located on. The temple is located 15 kilometres (9.3 mi) from the city of Chiang Mai and is a sacred site to many Thai people. From the temple, impressive views of Chiang Mai can be seen and it remains a popular destination for tourists. Sadly our spectacular view was limited to smog and the nearby airport but I guess on a clear day it would be wonderful. We paid a small entrance fee for being a tourist but no one checked the tickets so you could just walk on In. The temple is impressive with the gold leaf finish but it's hard to ignore the fact that this is a touristy thing and it felt like we were at a theme park seeing monks selling tack from stools. There are definitely better temples elsewhere. In the evening there are many things do see and do including watching a Thai boxing match, massage or if you are into shopping there are many markets on different days but the most popular is the night bazaar on Chang Khlan Rd (between Tha Phae Rd and Si Donchai Rd). 18:00-24:00. A huge indoor/outdoor market stretching along both sides of the road with the Night Bazaar Building at the centre of the maelstrom. It can take a concerted effort to find something interesting among the near identical stalls selling tourist-oriented trinkets, T-shirts and fake merchandise. You rarely see Thai people shopping here just tourists on vacation. One evening we had the privilege of meeting up with our good friend from school Phil Hughes who's been living and teaching English here for four years. Kind of makes our six months away from home look like a baby step. It always nice getting some sound local advice from a familiar face and reminisce about life. This naturally involved a lot of football banter and beer of coarse. 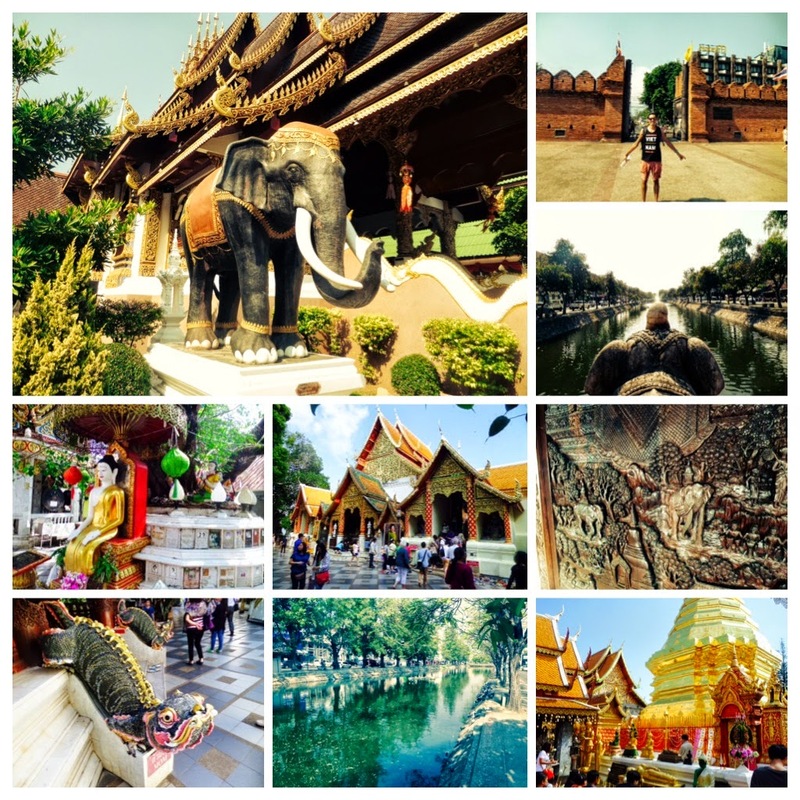 Chiang Mai certainly has enough to occupy travellers and tourists for a few days before moving on. Although if you don't enjoy being around other tourists and want to experience Thai culture your probably better going elsewhere. It's a bit of a tourist trap. In our case we decided to head towards Pai and try out the Mae Hong Son loop. Onward on the tourist trap trail.